The Man Cave entered a new era today. My youngest son played his first ‘at home’ high school football game. This is a MUCH different experience than being in the stands rooting for my favorite NFL team (see my earlier post about crazy Seahawks fans) and even different from the high school games I attended as a teen. No, this game featured MY BABY BOY, though well padded , facing potential tackles from the other team. The other team, in this case, is from across the island and full of Irish-American kids. GIANT Irish-American kids. I swear we were playing the Notre Dame farm team. Our team was notably smaller. The “center” might have been four-foot-nine. If he put “lifts” in his football cleats. “He’s little but tough,” my son insisted, “like a rabid Chihuahua.” Fitting, since he appeared to be no taller than the opposing teams’ shins. 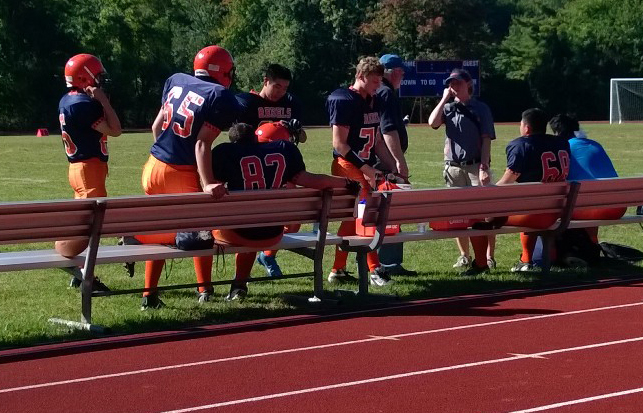 And much of the game went like that, with my son playing offense, filling in on defense and special teams and yes, me cringing, wincing, heart thumping up into my throat, sitting on hands so I wouldn’t bite my nails, and cheering every time he ended a play upright. Every time he whipped off his helmet to take a swig of water and smile at Mom and Dad in the stands. The way to a woman’s heart is through her stomach!